The Contact lenses by post scheme is aimed at making your life easier as with just one single payment you are getting the monthly supplies of your contact lenses and that too with fantastic offers! With Contact Lenses Express, the process is easy and reliable too. You have to just order online with the details of your prescription, and we will take care that you get the freshest possible lenses at your doorstep! 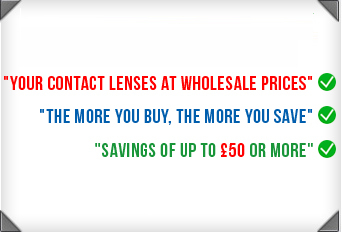 ContactLensesExpress really cares for your eyes and we guarantee you that you will get wonderful offers on contact lenses by post and lenses just like the ones you could have bought personally from your optician.